UUC Motorwerks is pleased to announce a new product offering, the E30 M3 UUC SwayBarbarian™. Fits all 1986-1991 E30 M3. 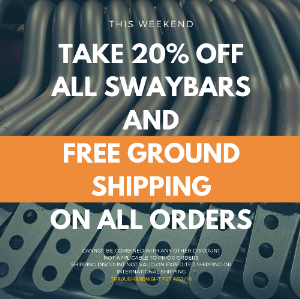 Created, designed, and manufactured by the leaders in aftermarket upgrades for BMW, the E30 M3 SwayBarbarian delivers superior quality and the ultimate in sway bar performance. UUC SwayBarbarians are cold-formed using custom-built precision bending equipment. Laser-cut bar ends and positive-stop bushing retainers are MIG welded in place using a precise fixture for an exact fit. Fixed-position front mounting, 3-position adjustable rear mounting. Positive-stop rear bushing guides to ensure bar stays in place. Race-spec spherical bearing adjustable rear end links for precision operation and tuning for height and corner balancing. 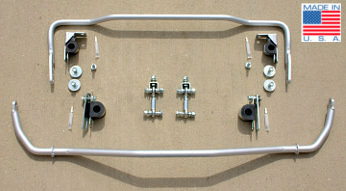 Complete bracket reinforcement kit included. The front bar has a single-position fixed mounting point. The rear bar uses a multi-hole (3-hole) system which allows for fine tuning of the chassis balance. Genuine Aurora Bearing link components are used for precision race control, yet are durable enough for long-term quiet street use. The E30 M3 SwayBarbarian includes replacement polyurethane bushings, which are built to "aircraft spec" (literally - our urethane fabrication facility uses the same material and production guidelines as they do for Boeing). This results in a durable bushing that will not disintegrate and has extended re-lubrication intervals for long-lasting, quiet results. Specifically built for compliance with NASA Spec E30 racing rules and track-tested with the assistance of Harrison Motorsports (the premiere Atlanta-area BMW race prep and performance facility), the UUC SwayBarbarian set for the E30 has the features and performance that will assuredly put many E30s on the winner's podium!